Most of the iPhone’s users are having unlimited data plan that allows users to browse internet and stay connected while moving around. However, there are still many that are having limited plan and if you are one of them that are looking for network usage tracking mechanism, here is one of the suitable apps that you can try. Known as DataMan, it is specifically designed to monitor your data usage, regardless if there are 3G or WiFi and help to alert you with pre-defined threshold so that you don’t have to worry about excessive data usage which could be still expensive in certain countries. Easy configuration and running in background so that it won’t disturb your current iPhone usage. Track data usage for both cellular and WiFi in details such as hourly, daily, weekly or monthly intervals. Alert users when the usage exceeds certain threshold which is fully configurable (up to 4 levels). Geo tagging capability with breakdown of data usage mapped for frequent travelers. No sign up or login required and is fully compatible to all service providers. 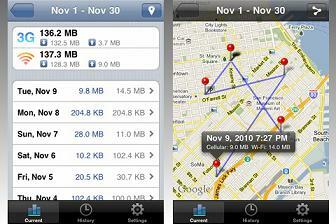 If you think DataMan (which costs $1.99) is too advanced but is looking for free one with much basic features, DataMan lite can be downloaded from App Store and is compatible to use with all iOS 4 devices (iPhone, iPad and iPod Touch) at no charge.